For the new S/S12 menswear mainline collection from Margaret Howell we see the Brit label revisit the classic Howell silhouette, offering that relaxed, lived-in aesthetic the brand is well known and loved for. Featuring a mostly neutral palette of beige, navy and slate, with the odd splash of colour of sunshine yellow on the featured raincoat.The high quality, seamless work of Howell's team is ever present in this collection and fittingly each piece offers an understated, refined appeal, enhancing it's wearer as oppose to hiding them. 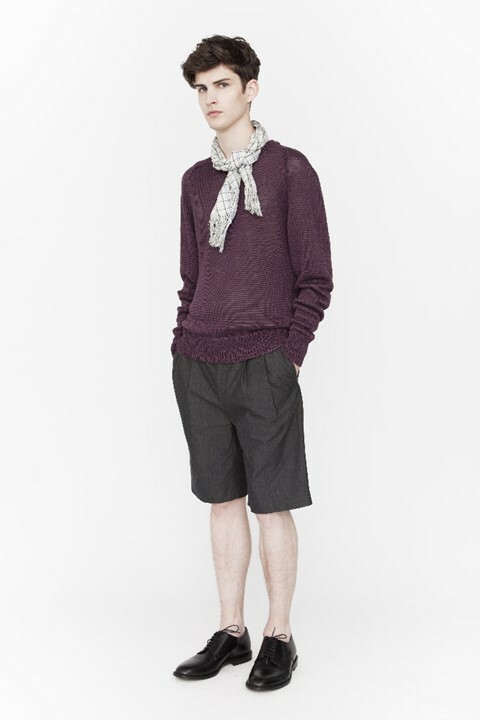 Howell has referenced the heritage of the brand and delves into their archives to produce key pieces, such as the double-breasted mac and hand-knitted sweaters by Marion Foale, for the modern man who seeks easy, wearable design, in high quality fabrics that will last forever. For MHL, the diffusion line, Howell takes on more colourful inspiration by referencing the bold stripes and colours of Louise Bourgeois, and images of brightly coloured beach huts that feature in Gotz Diergarten work. Elements of traditional workwear is also incorporated through the bright 'worker's blue' uniform colour that continues throughout the collection.